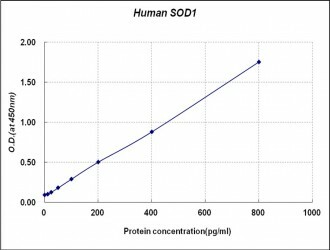 Superoxide dismutase (SOD) is an antioxidant enzyme involved in the defense systemagainst reactive oxygen species (ROS). SOD catalyzes the dismutation reaction of superoxide radical anion (O2-) to hydrogen peroxide, which is then catalyzed to innocuous O2 and H2O by glutathione peroxidase and catalase. Several classes of SOD have been identified. : Cu/Zn SOD (SOD1) is localized in cytosol, Mn SOD (SOD2) in mitochondria, and ecSOD (SOD3) in extracellular space.Cu/Zn SOD (SOD1) is a homodimer containing copper and zinc that is found almost exclusively in intracellular cytoplasmic spaces. 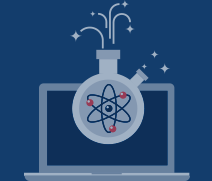 The level of SOD1 elevates in response to a wide array of mechanical, chemical and biological messengers such as heat shock, shear stress, and UVB- and X-irradiation. Decreased levels of SOD1 expression can also be triggered by activation of the AP2 transcription factor. A down-regulation of SOD1 has been shown in alveolar type II epithelial cells and lung fibroblasts after exposure to hypoxia. The genomic organization of SOD1 genes shows striking similarities between species and consists of five exons and four introns. The TATA and CCAAT boxes, as well as several highly conserved GC-rich regions, have been localized in the proximal promoter region. Also, more than 90 different mutations of the SOD1 gene have been associated with amyotrophic lateral sclerosis (ALS), also known as Lou Gehrig’s disease.